I fell in love with this polish the moment that I saw it on the shelf and couldn't wait to try it out. It is part of the Mariah Carey collection featuring 8 shades. 4 'studio' shades, and 4 'stage' shades. The 4 stage shades are the liquid sand ones. The liquid sand texture is what really drew me in to Stay the Night, I'm a sucker for textured and interesting nails. But none of the other liquid sand shades really appealed to me. 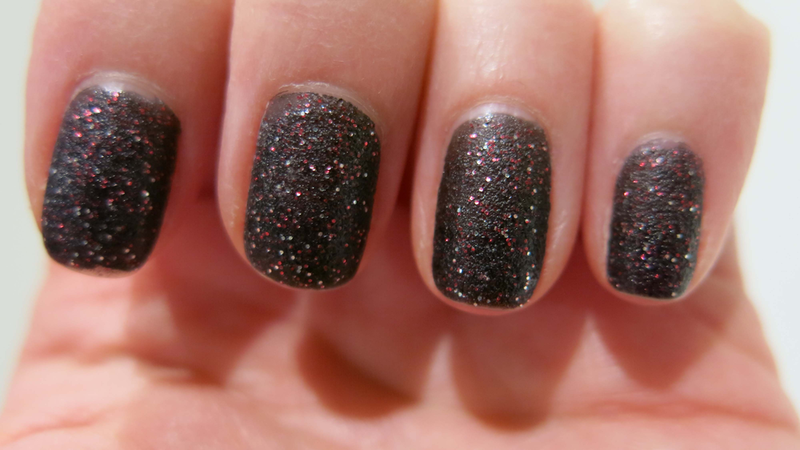 Stay the Night is a gorgeous mysterious black base with red glitter and a matte textured finish. The colour reminds me of the smouldering embers you get after a fire has burnt out. The OPI instructions are apply base coat, 2 coats of Stay the Night, no top coat. The polish is a little thicker than regular nail polish, but I found it easy to apply. Personally I love the finish when its is gritty and matte, so I have just been wearing it with out a top coat. But for the purpose of a well rounded review I applied a top coat on my most recent application. I found that it took a 2-3 coats of top coat to get a really smooth glass-like finish (I use Sally Hensenn Megashine, for anybody that is interested). And I have to say that I was very impressed! I think it really does look good with and without a topcoat. It seems that the patience of applying quite a few layer of coat is worthwhile. The effect is really striking. The topcoat seems to brink out the extra dimension of this polish. It deepens the black, so you get the red glitter just peeking through. I think that the result is quite a grown-up glitter. I have found that for me the liquid sand polish seems to wear quite well. The picture below is appox. 4-5 days after application. You can see that a little bit of the red has worn off some of the glitter, and the texture seemed to smoothen off a bit. But there were no serious chips, and at a distance the polish still looks quite respectable. With the topcoat the polish wore for even longer as you didn't loose any of the colour. However, when it did finally chip the damage was quite significant. I put this down to the amount of layers that were applied, leaving you with very thick nail polish. I haven't had a chance to play around with this polish yet but I have see some great results posted my other bloggers. Here are some pictures I found on the internet, other have found some really interesting ways to use the polish and it's texture. Overall I'm really pleased that I bought OPI Liquid Sand, Stay the Night and I can't wait to try it in some other shades.